Sure, squirrels can be pretty adorable. But when a dray of squirrels decides to move into your attic, it’s anything but cute. Squirrels can do all sorts of damage that you may not expect, and getting rid of them can be a huge hassle. If you have a squirrel issue, you’re not alone. According to a 2014 survey by the Chubb Group of Insurance Companies, more than half of all homeowners have discovered pests (squirrels included) living in their attic. An old roof can offer an awesome entry point for squirrels or other pests. Let’s look at the damage that squirrels can do to your home, and what you can do to live squirrel free. Squirrels can do a lot of unexpected damage to attic spaces. Those sharp little teeth that are great for cracking acorn shells are also powerful tools for chewing away at your home. First, they can chew their way into your attic. Loose soffit and fascia make ideal entry points. 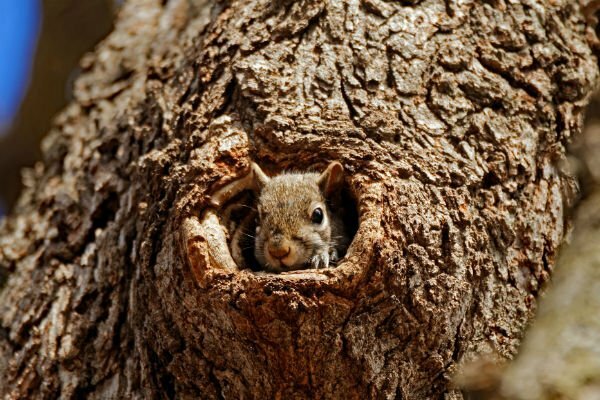 It only takes a hole about an inch wide for a squirrel to move in. If it’s a tight fit, they’ll chew away the edges to make the small opening even bigger. Next, there are your personal belongings. Squirrels like to make nests from soft materials. Pieces from clothes, blankets, and even books offer very comfortable material for squirrel nests. Squirrels often make these nests in chimneys or vents. The tight, dark spaces are very similar to hollow trees, which are their preferred nesting locations in the wild. Unfortunately, a squirrel nest is essentially a large pile of flammable materials and poses a serious fire hazard when built in vents or chimneys. Then, there are the electrical issues. Why would a squirrel chew on wiring? It isn’t food; it isn’t nice, soft nesting material. So what gives? Squirrels chew on wires to sharpen, strengthen and control the growth of their teeth. And once they’ve munched their way through, exposed wires become a major safety concern. Exposed wires can cause unexplained service interruptions, start fires, or even electrocute anyone who touches them. You or your contractor should be very careful when completing attic repairs from squirrel damage. You never know when you might come across an exposed wire hidden under insulation. Oh, there’s more. Squirrels have also been known to chew through PVC piping. Most water lines are made of PVC. Imagine the destruction that could be caused by a damaged water line in your attic! Like their rodent cousins, rats and mice, squirrels can also pose some risk to human health. Prevention is the almighty cornerstone in squirrel control. Squirrels most often enter your attic through gaps in vents, soffit, and fascia. It is imperative that these gaps in your home are sealed. Are there squirrels in your yard? Pay extra attention to your roof. Make sure that nothing is loose or in need of repair. If you’re in the market for a new roof, request that your contractor make all necessary repairs to the roof trim during the re-roofing process. Chimney caps offer another plus for prevention. Chimney caps prevent weather, debris, and animals from entering while allowing your fireplace to vent when in use. Read: How does a chimney work? Keep trees and low branches trimmed away from your home. A branch hanging over your roof is, from the squirrel’s perspective, a sidewalk to their new front door. Keeping foliage away from your roof will also help extend the life of your whole roof system, so it’s a win-win. Call in an expert. The Humane Society of the United States offers helpful suggestions and services for squirrels (or other wild critters) who’ve made your home their own. In the Washington D.C. metro area, the Humane Society calls this a wildlife conflict resolution service. Once you’ve removed your guests, it’s time to consider the overall condition of your roof system. Old roofs are easy targets for squirrel invasions, but more importantly, failing roof systems will allow the elements to penetrate, as well. If a creature the size of a squirrel can find a way in into your attic, then so can rain, sleet, snow or ice. Read: What is the whole roof system? If you’ve had squirrels in your attic, it might be time talk with a roofing professional about the condition of your roof system so that the squirrels can stay outside where they belong. Need a roof replacement? Give us a call. If you need a roof replacement, partner with Long Roofing. Contact us at (866) 275-4675 or visit us online to schedule a free, in-home consultation or find answers to any home roofing questions. Ask us about our industry-leading 50-year roofing warranty. We build trust and peace of mind into every Long Roof.